Matching gifts can help your nonprofit double your donations. However, if you’re only promoting one type of matched giving to your supporters, you could be missing out a lot of additional contributions. If you’re not familiar with the other forms of matching gift programs, we’ve got you covered! Matching gifts for corporate employees. Corporate volunteer matching gift partnerships. Matching gifts for board members. Matching gift challenges for major donors. 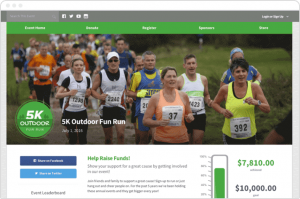 Matching gift programs can be a fantastic way to augment your fundraising strategies, since they require very little effort from you or your supporters. But you’ll only reap the benefits of these powerful programs if you know how to promote them effectively! Keep reading to see how you can get the word out about different types of matching gifts. Employee gift matching is probably the type of program with which you’re most familiar. Corporations create charitable programs where they will match their employees’ donations. Usually, the ratio is 1:1, but some companies offer different ratios. Why do employee matching gifts work? The donor gets to see their contribution go twice as far. The nonprofit receives twice as many donations without asking the donor for another contribution. The corporation helps out the organizations that their employees are passionate about. Learn more about matching gifts with Double the Donation’s guide. With employee matching gift programs, most of the responsibility rests in the corporations’ and the employees’ hands. However, there are still strategies you can use to help encourage donors to submit a request. 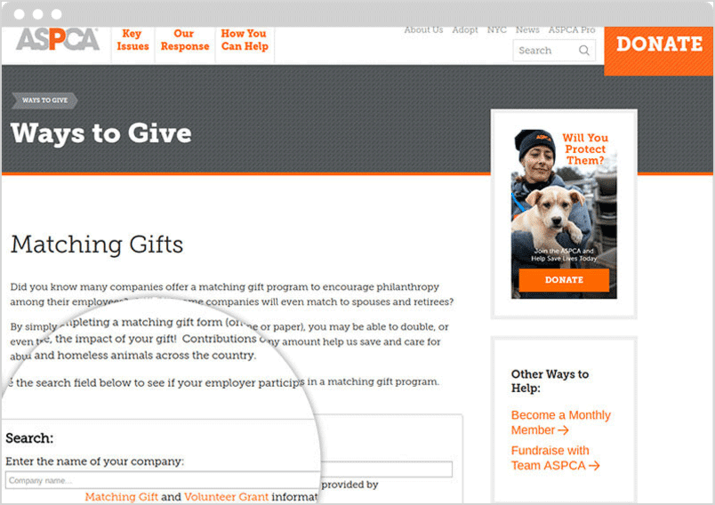 One effective way is to include a matching gift search tool on your nonprofit’s website and online donation forms as a way for donors to check if their employer supplies matching gifts without having to leave your page. The more knowledgeable donors are about the process, the more comfortable they’ll feel submitting a request. The goal is to regularly remind donors about matching gifts and provide them with the right information. Keeping donors informed throughout the online donation process will keep matching gifts at the front of their minds and make sure that they have the information they need when the time comes to submit their request. The bottom line: Employee matching gifts may be one of the traditional forms of matching gifts, but donors still need to know about the process and how to submit a request. Companies and business owners are already making charitable donations. Why not ask them to match your donors’ gifts up to a fixed amount? For this type of program, you’ll need to reach out to companies and see if they’d be willing to match gifts. If you’re unsure of who to ask, start with the companies that have contributed to your nonprofit in the past. Why do company matching programs work? Your nonprofit won’t have difficulty finding companies to partner with because matching programs benefit local businesses by receiving social media and brand promotion. Additionally, every donor, not just the supporters employed by the company, can participate in this program. You can match the gift of every supporter to maximize your fundraising potential. Once you’ve got the cooperation of a company, you need to let your donors know about this opportunity. Using social media is a great way to spread the word. 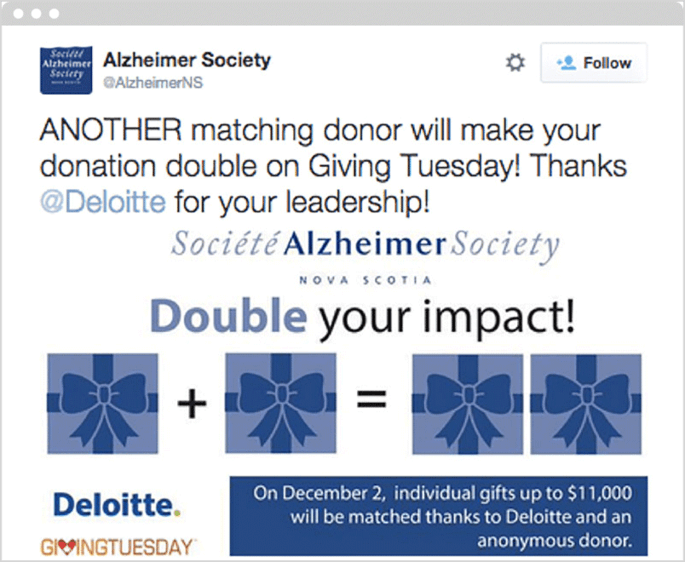 The Alzheimer Society used this short, sweet post to promote their partnership with Deloitte for #GivingTuesday. They also included a visual that helps donors see how they can double their impact. To promote your own campaign on social media, you should make your message simple and concise. Don’t overload the donor with too much information. Instead, provide them with a link where they can learn more about the requirements, restrictions, and submission process. The bottom line: Think of a company matching gift program as a way you can take more control of matching gifts. You get to reach out to the companies you’d like to work with. Volunteer matching is when corporations will donate a certain amount of money depending on how many hours the employee has volunteered for. In other words, employees can have volunteer hours matched with their company’s dollars. The nonprofit will receive support in two different ways to help further their cause. 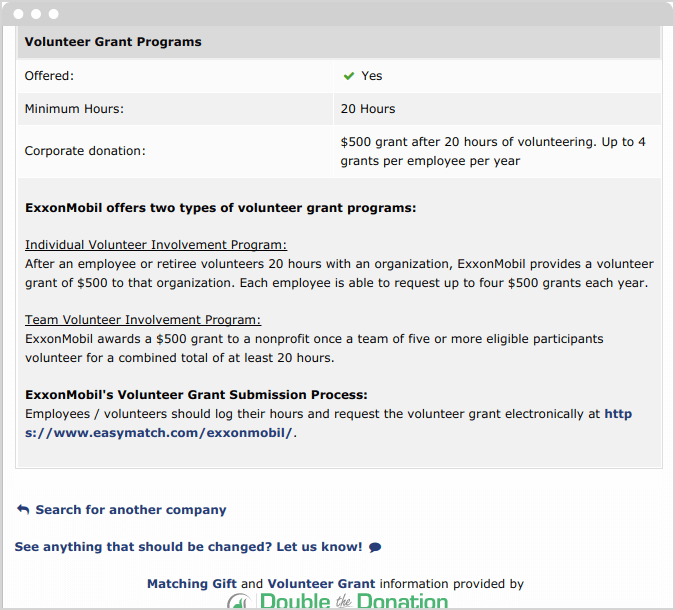 For example, ExxonMobil offers volunteer matching. For every 20 hours an employee volunteers, the company will provide the nonprofit with $500. The company gives up to $2,000 in volunteer grants per employee each year. With volunteer matching, donors have a unique way to contribute to their favorite organizations and causes. Why do volunteer matching programs work? Sometimes supporters want to contribute to your nonprofit in a way that isn’t just monetary. Volunteering is another option. Not only can the donors support your nonprofit with their time, but they can contribute their skills. Depending on your nonprofit, employees can use their talents to promote a nonprofit’s cause, serve the community, and so much more. Additionally, if employees don’t have the financial means to make a gift to their favorite nonprofit, volunteer matching gives them a way to contribute and still have their gift matched. Like with all of the matching gift programs we’ve covered, donors can’t submit a request if they don’t know this option is available, or if they don’t know how to put in a request. Volunteer matching gifts should be a program that you promote along with every other matching gift program. Use social media and email to let donors know that this is another option available to them. Plus, most companies offer both an employee and volunteer matching gift program. Encourage donors to use both programs so that your nonprofit can benefit from the extra support. The bottom line: With volunteer matching programs, donors can take an active part in supporting your cause. And, you still receive support in two different ways. While many corporations match their employees’ gifts, there is also a significant portion of companies that offer bonus gifts for employees that are nonprofit board members. If employees (or even retirees) serve on a nonprofit board, they could receive higher matching ratios or limits on their matching gifts. 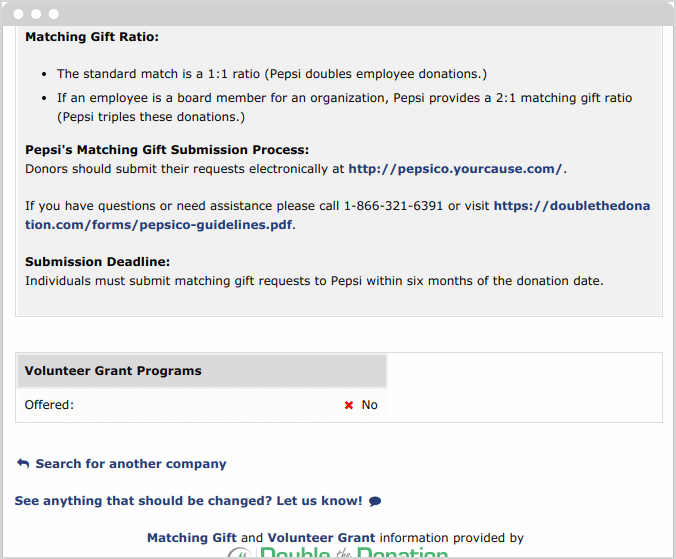 For example, while PepsiCo doubles the average employee matching gift, they actually triple employees who serve on a nonprofit organization board for up to $10,000 at a 2:1 ratio. Find more information about more companies that accept board matches. Why do board matches work? Supporters that serve on a nonprofit board are more likely to make donations. In fact, their contributions are usually larger than those of donors who do not serve on the board. Having a higher gift ratio and limit means that nonprofits can receive more funds because those contributors often give more. Additionally, corporations can show that they support the nonprofits that their employees are passionate about. Reach out to your board members so that they can be aware of this program. You can reach out to them during board meetings or through specific communications directed to board members. That way, they’ll know the information and be prepared when they make their next contribution. The bottom line: In addition to the traditional employee matching gift program (see above! ), you can also double or even triple the funds you raise by promoting board matches. You can seek the help of your major gifts supporters or even board members to see if they would be willing to offer a matching gift challenge. See if one of your big supporters will donate a significant contribution if your nonprofit can raise an equivalent or higher amount. For example, the president of Kent State University offered a challenge where she would match up to $25,000. 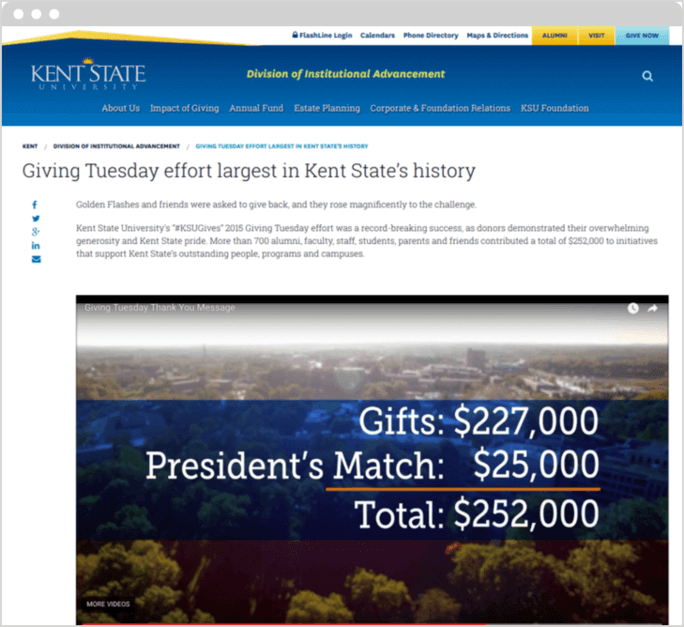 At the end of the challenge, Kent State University raised over ten times the match amount. Why do challenge matches work? This program works because your major gift donors want to support your cause in a meaningful way. A challenge is a great opportunity to show their passion for your cause and to encourage other supporters to give. Additionally, donors don’t have to take any extra steps like submitting a request to see this match fulfilled. All they have to do is donate and motivate their peers to do the same. In fact, a recent study showed that a challenge match attracted 23% more supporters and increased total contributions by 18% when compared to a similar campaign without a challenge. To have a successful challenge match program, you need to promote it on as many channels as possible. You have a better chance of reaching your goals and having your funds matched if you reach as many donors as you can. Use social media and email to remind donors about the challenge and how far their funds can go. Plus, don’t forget to tell them that no additional action is required. The bottom line: Since your major contributors want to show their support and donors don’t have to complete any extra steps, challenge matches can be an effective way to raise funds. Now that you have more knowledge on the different types of matching gift programs, you can start promoting them to your donors. Once donors feel more comfortable with the process, they’ll be more likely to submit requests for matching gifts and use all the different options available to them. Combine matching gifts with your other fundraising strategies so that your nonprofit can maximize your fundraising potential. 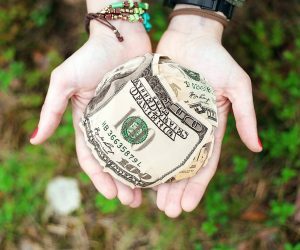 15 Corporate Matching Gift Programs All Nonprofits Should Know — Itching to know more about how your nonprofit can benefit from matching gifts? Check out our top picks for corporate matching gift programs and tools! 360MatchPro’s Matching Gifts: The Expert’s Guide — Learn more about how you can grow, solicit, and market matching gift opportunities with 360MatchPro’s leading matching gift services for large nonprofits. 360MatchPro’s Top Matching Gift Companies — Look into established matching gift companies and what they can do for your nonprofit with 360MatchPro’s definitive ranking, including volunteer grant programs. Learn more about matching gift integration with our incredible Fundraising Bootcamp!